Tai Chi. Tai Chi is a Chinese martial art that is a gentle form of exercise. Practice inside, outdoors, on your own, or as part of a group, Tai Chi can help you maintain strength, encourage flexibility through stretching, help with balance, and reduce stress. Tai Chi is a method that can benefit every generation. Find your inner Zen and a beginner class near you or your loved one at a local senior center. Yoga. Yoga is similar to Tai Chi because it is also a gentle form of exercise that can relax the mind and body. A good deal of yoga moves focus on stability and balance which can help to reduce the likelihood of falls as one gets older. Many seniors enjoy modified “chair yoga” classes where participants practice while sitting in a chair or using a chair as support. Dancing. Dancing is a wonderful way to reminisce and to feel young again, while getting your heart pumping. As you twirl your partner on the dance floor to a tango, rumba, or waltz, you might just forget that you are working out and improving your physical health. 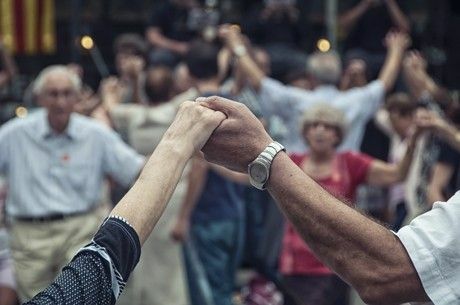 For many seniors, dancing is also a great social opportunity to engage with their peers. Gardening. The biophilia hypothesis proposes that humans have an innate tendency to seek connections with nature. This connection with nature has shown to reduce stress, enhance creativity, improve well-being, and expedite healing. Many seniors can still enjoy gardening by adapting how they garden. We suggest a raised garden bed or vertical gardening wall to help seniors garden comfortably without neck or back strain. Volunteering. A strong predictor of our health as we age is how fulfilled we feel. Research has proven that a sense of purpose can improve our personal satisfaction, increase our happiness, buffer us from stress, reduce our risk of disease, and can even help us sleep better. In our Aegis Living communities, we partner with local charities—from knitting baby hats for preemies to baking dog biscuits for local shelters. Our residents can stay involved and use their skills to better the communities in which they live. At Aegis Living, we know the importance of our residents staying active, engaging in projects, and socializing with their friends and neighbors through healthy hobbies. Our Life Enrichment program includes daily options to take part in brain exercises, physical fitness, current events, local outings, arts and crafts, volunteering, music therapy, and much more. Our Life Enrichment Directors in each community cater activities to the needs, limitations, and interests of their residents. We take great pride in providing a rotating calendar of healthy activities that appeal to and entertain our residents each and every day.